After over two years of living with our ancient pink bathroom, and having bits of ceiling fall on my head whilst showering, the boy and I have finally saved up enough money to join the 21st century! We knew that buying this house meant a major project for the next 5 years at least, but when we moved in we knew that the bathroom really had to be the first thing. The only toilet in the house was a tiny post-war outhouse just off the kitchen - without the ancient lean-to surrounding it, we'd have had an actual outside loo! Anyway, renovating our bathroom involved moving an internal wall and stealing a bit from the already small third bedroom so that we could have the luxury of having an upstairs loo. It was so hard to decide how much space we needed and I spent many an hour with tape measures and floor plans. The boy finds floor plans and measurements very stressful, so left all of the design work to me. In the end I think I got the balance about right, but I think we probably could have taken maybe 10cm less from the box room and the bathroom still would have been big enough. That's Billy in the picture. Billy was lovely, as were all of our builders/plumbers/carpenters/decorators. Nothing was too much trouble and they were excellent at problem solving the many issues that arose! Not having a bathroom was completely rubbish. I dusted off (and squeezed into!) my ancient swimming costume and started going to the leisure centre round the corner so I could have a shower and wash my hair. It turns out that you can actually forget how to swim. Old lady breast stroke I can still do, but my attempt at crawl resulted in me almost drowning! The boy buggered off to his mum’s during the weekend, leaving me to it, and when the leisure centre had no hot water either and I had to wash my hair under a freezing shower, I did almost cry. 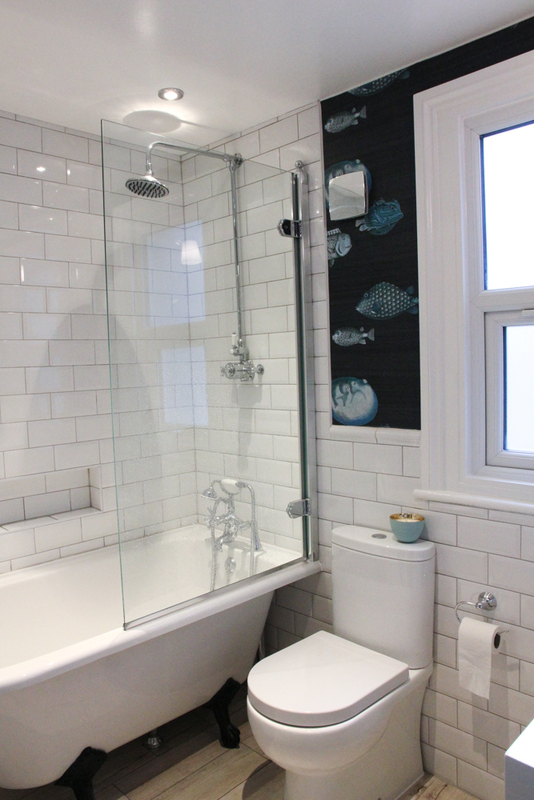 It was all worth it in the end though - look at our lovely bathroom! I have wanted a bath with feets for as long as I can remember, and I wasn't going to let a tiny thing like the fact that our bathroom is way too small for one put me off. I found this Burlington Hampton Shower Bath, which comes in a 1500mm length so just managed to squeeze it in. The fact that the bathroom had an angled wall made it really difficult to work out how to fit everything in as well. I couldn't find a vanity unit to fit the weird little bit of wall where I wanted the sink, so our builders made me one. I had originally wanted this gorgeous wallpaper on the walls around the sink and window, but it's made in the US and their shipping costs were completely ludicrous! I spotted this amazing Fornasetti Acquario wallpaper and thought it would be a good substitute and I love it! The boy was very happy. When I originally said I wanted wallpaper with bats on, he was so confident that such a thing couldn't possibly exist that he was all "well if you can find wallpaper with bats on then you can put it in the bathroom". He was not expecting me to find wallpaper with bats on. He likes the Fornasetti fish wallpaper much better, purely on the grounds that it does not have bats on it! I then found this rather fabulous porthole style mirror in Next and thought it would work in a nautical kind of way with the fish wallpaper. Asked the boy if it was a bit much to pair portholes with fish and he pointed out that at this stage the concept of 'too much' had pretty much gone out of the window. He gave me a despairing look. I bought the mirror. Even though there are some quirky elements in our new bathroom, the basic design of white metro tiles, wood plank effect porcelain floor tiles and white bath/sink/loo combination will stand the test of time I think. Every time I walk past the door, I have to open it to have a little dance of joy at finally having a proper bathroom! On Christmas day, I will be lying in my bath with feets, drinking champagne.